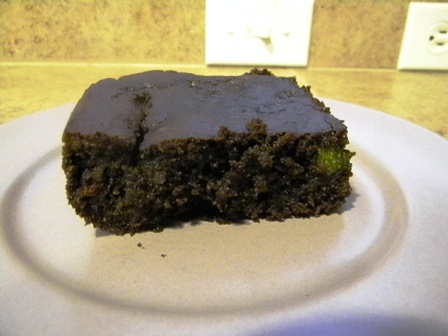 My grandmother always used to make chocolate zucchini cake when I was growing up. I used to love that cake, so I wanted to see if I could make a slightly beyond SCD version. The only non-SCD ingredient is unsweetened dark cocoa powder. I used my grandmother’s old recipe, and made the necessary substitutions. I used peanut flour, with a little almond flour, because it is a little lighter than almond. It worked perfectly for this cake, but you could probably use all almond flour as well. Cream together butter, honey, applesauce. Add eggs, vanilla, vinegar, and yogurt. Mix for a couple of minutes, until smooth. Add flours, salt, cloves, cinnamon, baking soda, and cocoa. Mix well. 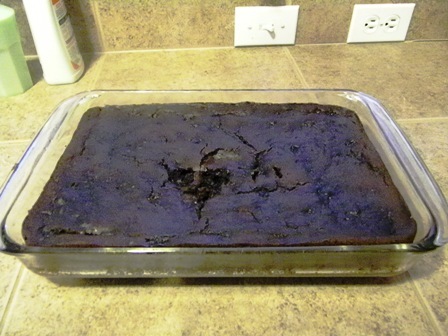 Pour batter into a greased 9 x 13 cake pan. Bake for 55 – 60 minutes until knife inserted in center comes out clean (cake will be very moist, but should be cooked through).